The process of education is always more successful if it is companied with exchange between the youth. These days there are a lot of different events striving to improve cultural exchange. By this article you will have the chance to know about The HNMUN (Harvard National Model United Nations). The HNMUN has been organized this year for its 61st time. It is a simulation of United Nation Organization work and it is organized by students of Harvard University. This year, 3.000 students from 70 different countries and 100 Universities, in Boston, United States were part of it. 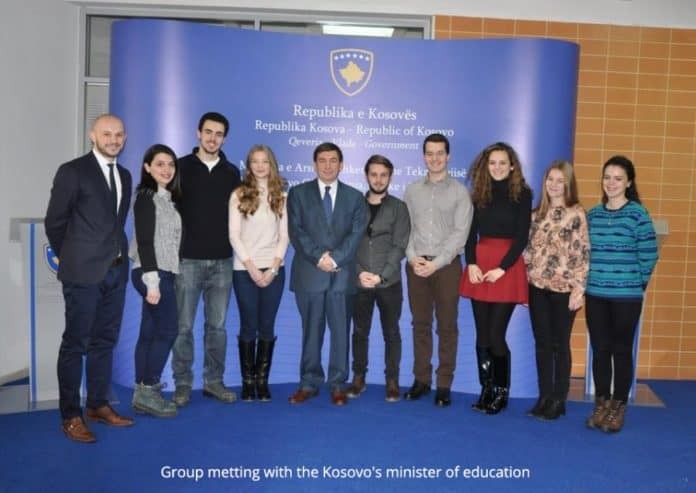 University of Prishtina, participating for the 4th time, this year has been represented by 10 students, and two professors. It is also important to mention that University of Prishtina, Kosovo was the only representative university from the Balkans. Following here is an interview with the head delegate from the group of Kosovo, Leon Gojani. We can imagine all the procedures you have been through for being selected for the HNMUN, so I would like to ask you for any advice or message for readers of the International Magazine ‘’Youth Time’’ when they come to apply for such projects for the youth? Firstly, I would like to thank Youth Time Magazine for this opportunity to share my experience that I had in such a conference as HNMUN (Harvard National Model United Nations) in Boston, United States. Lately, I have been reading many of the articles on your website and I can say that you are doing an impressive work. Congratulations! The selection procedure, it was really tough honestly. There were over 100 students of University of Pristine who applied to be part of the UP team. Then, only 10 of us made it to represent University of Pristine at this prestigious conference. I would like to tell every single young reader of magazine that it is very important while you are a student to be part of conferences and projects like this. You get to know many people, you share your culture, your differences, and you get to know yourself better. And yes, professionally, I would say it is impressively helpful for your career as you learn by sharing from each other and it does cut the stereotypes that you might have for a nation or group of people. Do not hesitate to be part of this kind of activities. Also, never get disappointed if there will be few rejections of your application. In 2012, when I applied for the first time for this conference they put me on waiting list in case someone cancels. But, I did not give up, did my best, applied for this year and made it! This year Kosovo was together with 70 different countries from the entire world, above of all it means different cultures. How was it for you to carry on the responsibility of representing your country in front of all of them? This is the loveliest part! You are the ambassador of your own country and your own culture. Every conversation you have every game you play or the way you are dressed on leads you to the hours of talking about the differences that cultures all over the world have. Hence, it is a responsibility to show your country as perfect as possible to someone who has probably never even heard that your country exists. And, you are willing to proudly wave your flag at the international evenings that we had and tell them where you are from, your music, traditional food, your world famous people and history of your nation. As we were the only delegation from the Balkans, we also mentioned the Balkans livelihoods, ethnic differences and the problems surrounded us in the past. It was quite interesting to look at people’s reaction when they meet someone from Kosovo for the first time, as they still picture Kosovo as a war country. You just mentioned that such projects for the youth are very helpful in cutting the stereotypes and gather the youth together, despite the differences. How it was for students from a post-war country to achieve this? As you get a chance to meet the other youngsters of the world you see no difference when it comes to emancipation. And here I want to point out the importance of this kind of projects. Unfortunately, we all do have stereotypes for each other. We face many times the reality that the people out of Balkans still picture Kosovo as a war country, and, once you prove them different then they start knowing the real Kosovo. But this is not only our problem, we do have stereotypes also for the other nations and culture and when you get together with them in such a projects you realize that what you thought of them does not match the reality. It is very important to mention the reaction of people in Kosovo when we came back from the conference. They did not hesitate to proudly say that this generation needs to be more active, more participating and building a new image of ourselves. Once an old man who lives nearby my house told me; you are the hope of getting this country forward. We were bombed out of media right on the first week we arrived home, invited on the meetings at very important institutions and many other students who would like to have the same experience and questioning us and ask about everything. What was the most impressive thing that you have gained from this experience, something that can serve as a lesson for all of us? There were many impressive things we gained during the conference that right now seems quite hard to choose one. As we were all representatives of different countries and trying to push our interests further, I would say the negotiating part between delegates was the most impressive thing we all experienced. We had the interests of our countries first, and then we had to find ways to get support and votes from other countries. By that, I believe now we are more aware of how to push further the interests we are representing or how to be convinced when you present an idea to other, and I think this is very important and helpful even in daily life. How this experience did affect your life story? Also do you think that social change can come from individuals who strive for a better world? Every change comes from individuals with great minds who find other great minds and strive to make the world better, together. An experience like this helps you get your pieces together and come out more completed than ever. After you get back to your reality, you meet the same people, go at the same places, and do the same things. But, there is something different you face every day, is you and the way how you see yourself now. And that is really impressive!